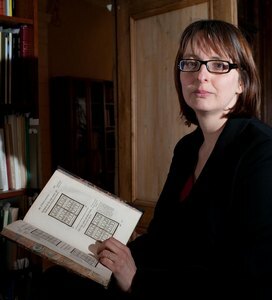 Knuf Rare Books is owned by Anita van Elferen since 1996. After graduating from the University of Nijmegen, the Netherlands (English Language and Literature) she became the assistant of Frits Knuf who founded the company in 1953 and on his retirement she took over the business. We are interested in rare and unusual books about books with emphasis on the history and technique of printing and type specimens and on the earlier bookseller- and auction catalogues as well as in early art auction catalogues. In our stock you can also find books on architecture, art, calligraphy and any other good books we cannot resist buying. We also have an extensive stock of modern books about books. We are a member of the Syndicat National de la Librairie Ancienne et Moderne (SLAM) and the International League of Antiquarian Booksellers (ILAB). We are originally a Dutch business but since 2001 we are located in Vendôme, France, where you are welcome to visit us by appointment. Being close to Paris (only 42 minutes by TGV) where we have an additional address in the 5th arrondissement (also by appointment), we would be happy to view and bid at auctions on your behalf. We develop collections and try to fill gaps in existing collections. Many of the important libraries can be found among our clients. We participate in several international and national book fairs each year of which the most important ones are New York, Paris, London and Amsterdam. We would like to meet you there in person. We issue one to two catalogues each year which upon request we will send to you free of charge. To all of you, from all of us at Knuf Rare Books - Thank you and Happy eCommerce!